Amit Shah is on a six-day tour of the state during which he will interact with the party workers from different districts. 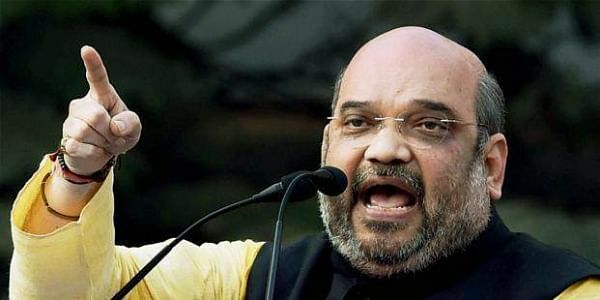 GANDHIDHAM: BJP chief Amit Shah today slammed Rahul Gandhi for talking about farmers' plight in Gujarat during his campaigning for the Assembly polls, claiming that the Congress vice president was relying on a "chit" given by some NGO to speak about farmers' issues. Shah also accused the Congress party of trying to mislead the people of Gujarat and challenged it to discuss the issue of development and fight the upcoming Assembly polls on the development plank, instead of raking up the issue of caste. The BJP president claimed that the condition of farmers has improved under the BJP rule and 25 lakh youths in Gujarat have got jobs under the Centre's MUDRA scheme. "Rahul Gandhi is going around the state and talking about farmers based on a chit handed over to him by some NGO. He does not know that the BJP government achieved what the Congress government (during its rule in the state) could not," Shah told reporters in response to a query about Gandhi's claims during his poll campaign tour that farmers were suffering in Gujarat. Shah said that milk production in the state went up from 46 lakh tonnes during the Congress government to 122 lakh tonnes, and production of foodgrains also touched 63 lakh tonnes annually. The BJP president is on a six-day tour of the state during which he will interact with the party workers from different districts. The 182-member Gujarat Assembly is scheduled to go to the polls in two phases -- on December 9 and December 14. "As many as 25 lakh unemployed youths got Rs 16,110 crore assistance (for self-employment) under the MUDRA Scheme, and he (Rahul) says that only 500 people get employment daily in the country...Rahulji, these are the figures only of Gujarat," the BJP president said. Gandhi, who yesterday completed this three-day tour of south Gujarat as part of his poll campaign, had attacked Modi government over the plight of farmers in the state and had said that Gujarat government's land acquisition Act was "authoritarian". He had also said that Modi government had failed to provide 2 crore jobs annually as promised. Shah also accused the Congress of raking up the issue of caste. "It is not going to work," he said. He also challenged the opposition party to debate with BJP over the issue of development. "Congress is trying to rake up the caste factor. But people here have suffered due to this during (former Congress CM) Madhavsinh Solanki's rule. So they are not going to fall in the trap again," he said. "Congress is trying to mislead the people of Gujarat. I challenge the party to discuss the issue of development and fight the election on the basis of development," he said. He said that the Modi government at the Centre was taking gas cylinders to the poor and helping them to open bank accounts. "Gujarat will be doubly benefited if the BJP forms a government here," he said. Shah also alleged that during the UPA rule, Congress did injustice to Gujarat by holding back the completion of Narmada Yojana project and not approving crude and gas royalty of the state. "All these projects were completed after the BJP under Modi came to power at the Centre. "The Congress misappropriated Rs 12 lakh crore in its 10 years of rule. The Congress should first answer who were behind the 2G scam, ISRO scam, Adarsh Society and CWG scam," he said.